Dedicated to the wellbeing, self discipline, physical fitness, positive social interaction, self esteem, self-defense and self-control of our young martial artists. U.S. Taekwondo will not be providing lunches or snacks. Please make sure you pack your childs lunch and snacks for the day if in summer camp and maybe a snack for after school. They will also need a school uniform for their Taekwondo classes. Any other items that may be necessary for special events or field trips will be announced. A secure, safe environment is at the core of U.S. Taekwondo. When you arrive or leave U.S. Taekwondo your child will be checked in and out on the sign-in sheet. This gives staff and instructors up-to-the-minute attendance lists. 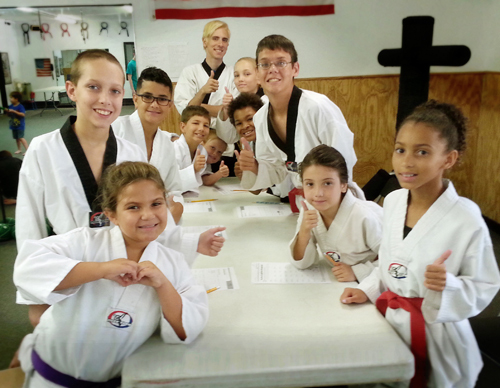 To ensure childrens safety, U.S. Taekwondo keeps a file of names, addresses and phone numbers of people authorized to pick up each child in case of emergency. The file is based on information provided on the enrollment forms. Notify U.S. Taekwondo in writing of any changes, as children cannot be released without proper authorization. Anyone picking up your child must show proper identification, such as a drivers license, before we can release your child. It is U.S. Taekwondo policy that no one under sixteen years of age (unless it is the childs parent) is permitted to pick up a child. In the case of divorce, it is important that you indicate on the enrollment form who the custodial parent is and who may pick up your child. The parent with custody is required to provide us with a copy of the divorce decree, which will be kept confidentially in your childs file. If a fire, severe weather or other emergency occurs, it is crucial that children react in a safe and orderly fashion. Children participate in regular drills and practices so they will know what to do in the case of and actual emergency. Should an emergency happen, we will notify you.